Hi friends can anyone tell where I can find the control panel in windows 8 release preview? Re: Location of control panel in windows 8 release preview? In order to open the control panel in windows 8 follow any of the below methods. Press “Windows Key + R” on the keyboard. This will open the run or command prompt. 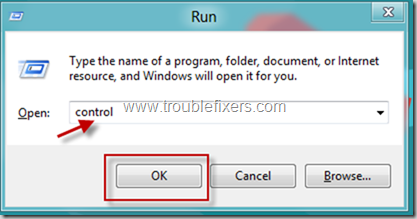 In the run prompt window Type Control and then press enter. You will now be taken to the control panel window. Click ON the bottom left part of your Windows 8 screen. A menu will appear on the left side. In the windows that appear click on settings. Tap or Click on the Control Panel link on the Settings menu. 1.First Right click on the START button.in the bottom left corner. 2.this allows you to switch between the desktop and start screen. 3.Now, you will find the CONTROL PANEL in 5 th position from bottom. type RUN in the search field. select the RUN icon & click on it. type CONTROL in the run field & press enter. you'll see control panel in front of you. or you can Press start(win Key) and type "con" so that windows automatically suggests Control panel for you!!! There are 2 ways to open the control panel. 1. Go to the start menu and there you will find the control panel icon on the list. 2.Press "windows + r" than type control panel in it. ~~> Now Control panel will appear on screen. ~~> At the top near menu area you will find Control panel. Hope this information helped you. 1. Press "Windows Key + R" on the keyboard. 2. This will open a dialog box of RUN. 3. In this, type Control & press Enter. 4. You'll get the result & Control panel will open. 1. Click on the main button(named Start normally). 2. From the list of menus, select option of control panel under the settings criteria. 3. Control panel will open. 1. Open My Computer from main menu or Press Ctrl + E to open my computer. 2. At the top, you can easily find out the option for control panel. Well, I guess this information will help you a lot.